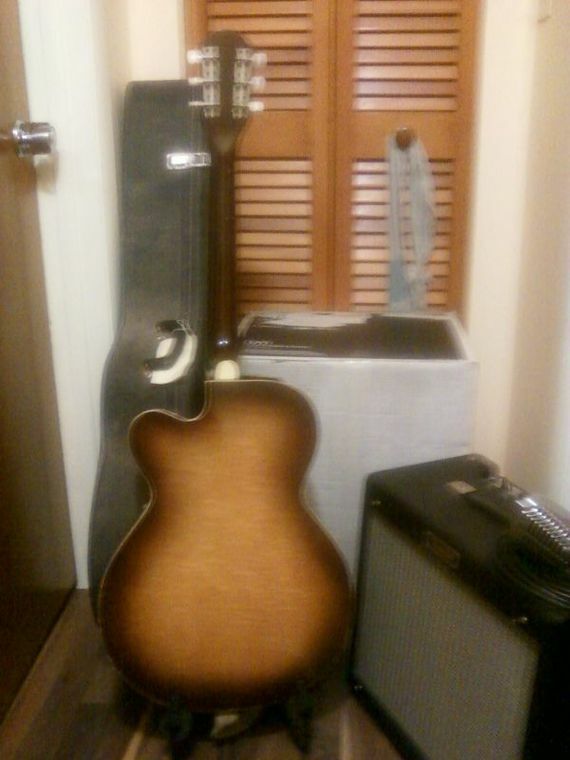 I bought a used Fender Blues Junior. Gasp! How is it? I bet it's fun, eh?Got a pic of her? Fun? I've always been intimidated plugged in to amps. Yeah, it may be a bit fun, I'll have to see what I can do about pics. Got an old Shure mic from the '60's I thought might be good for harmonica; felt real heavy when I unpacked it, but it seemed to work good with the harp. 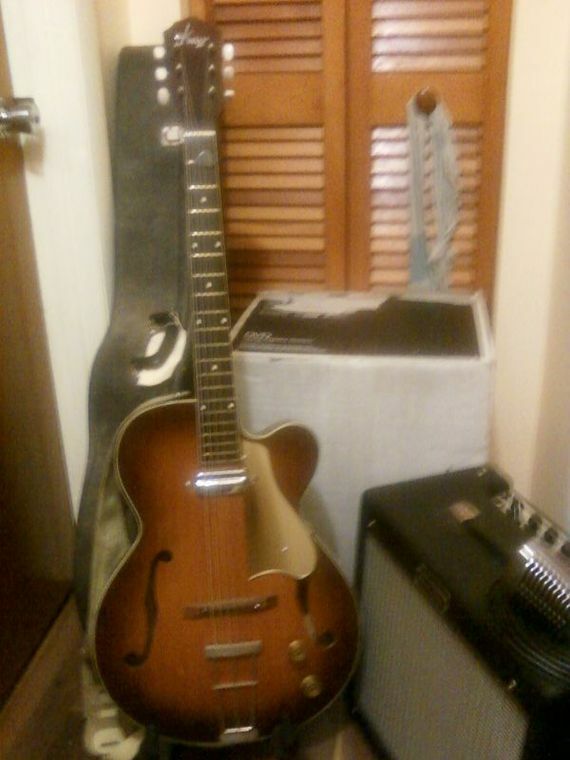 Also got an old Kay Swingmaster, semi hollow, one pickup, guitar. 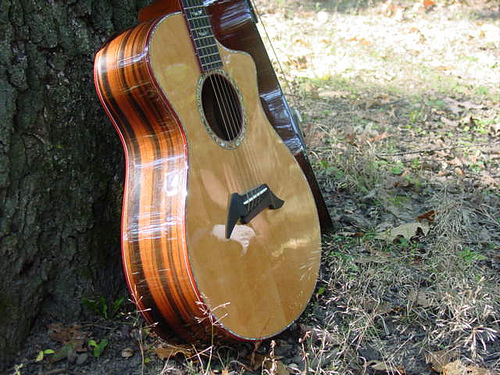 It had close to an acoustic feel to play, & a spruce top, that makes an enjoyable, though not loud, unplugged sound. I think it needs a neck reset, though. Curse those Traveling Wilburys, see what they've done to me! Now for the electric mando! 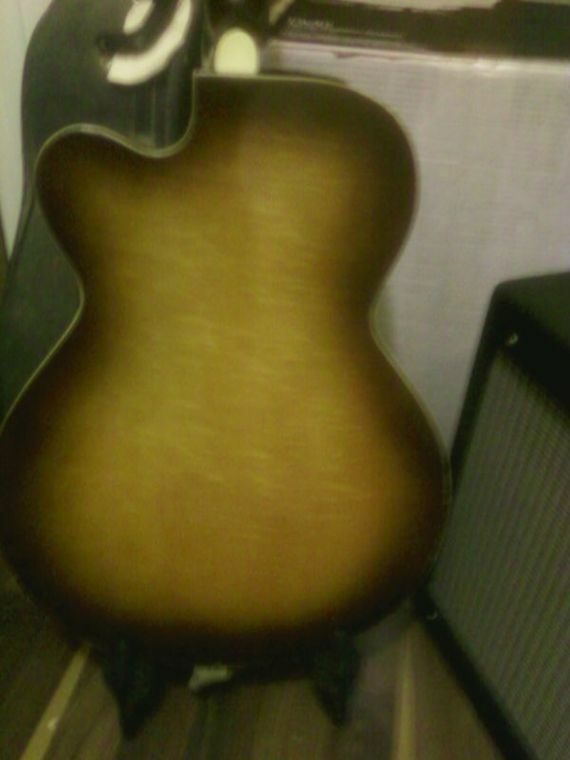 I was hoping to show the flame of the maple back & the grain of the spruce top, but instead you can see my reflection in the mirror someone replaced the pickguard with. 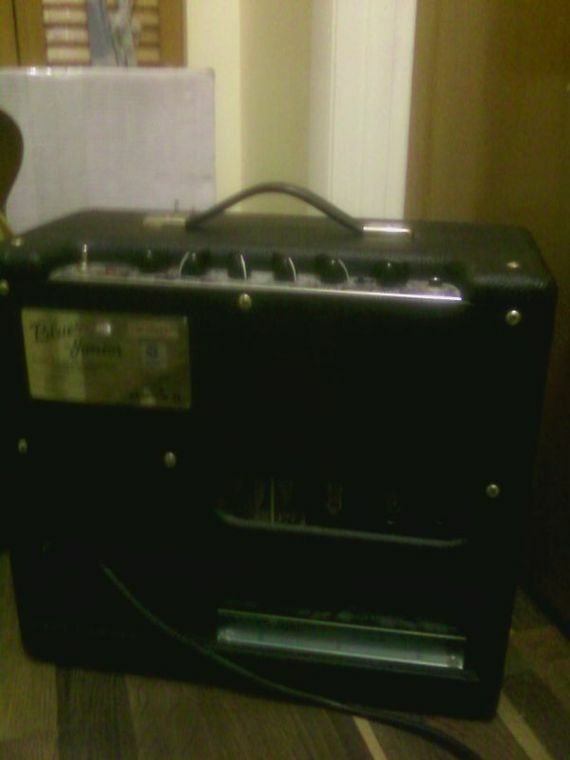 Seller threw in an old hard case that almost fits and an 18 foot cord. Mic is a Shure model 51S, has paper info dated 1967, on-off switch, impedance 3 way switch, & weighs one & three fourths pounds! 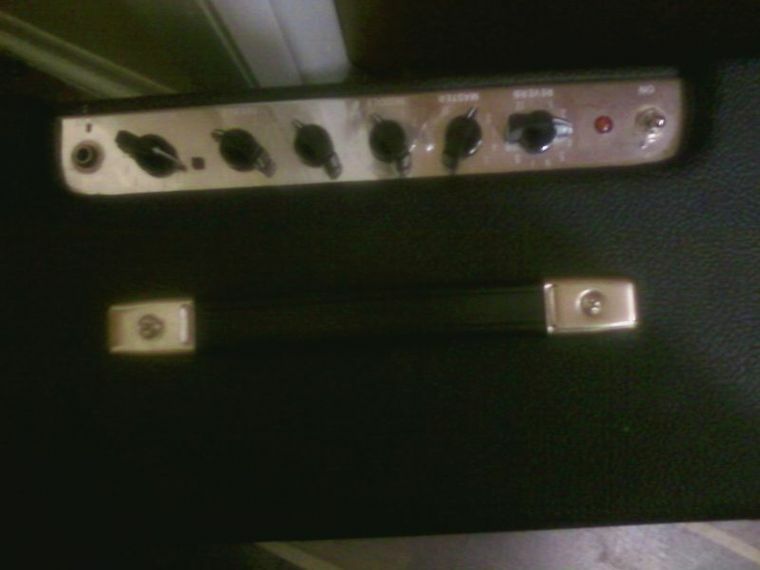 I'll probably flip the amp, they're good amps, but I don't think it's what I want, & I found an old Kalamazoo Epiphone on ebay that Looks like I might like it. Ten inch speaker instead of the twelve on the Fender, though. 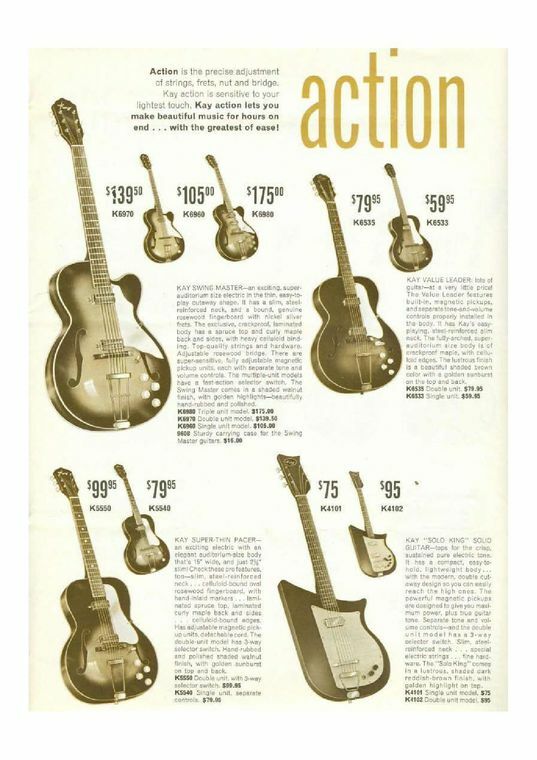 I wanted to post a page from a PDF of the 1960 Kay catalog, that confirms the model for the guitar, but can't seem to load it. Okay, I converted the page to a PDF & stored at Yuku, but I don't know if you can see the detail. MS, it looks like your back in the game! Electrified! Does the guitar have a bluesy tone or is it more jazzy? From my limited experience with the arch tops they always leaned toward jazz. 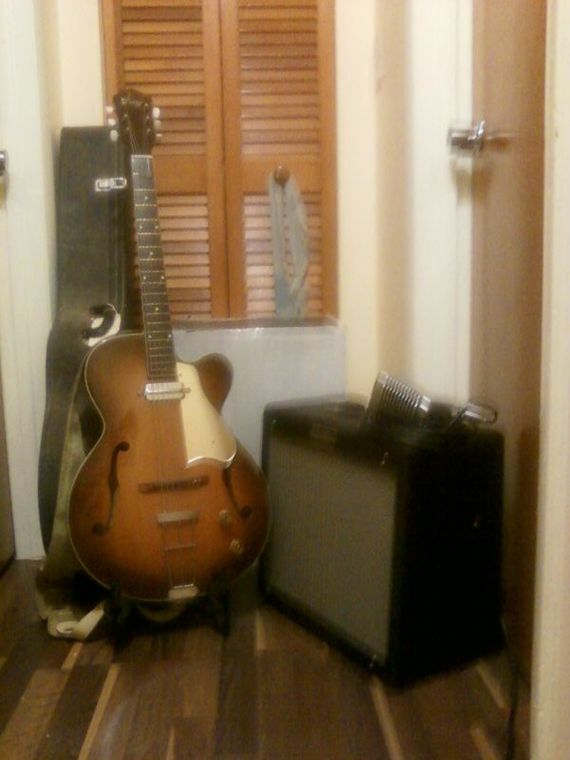 The guitar looks to be in really good shape. Enjoy!! I think the answer is yes! Probably more jazzy, I suppose. Still not used to plugging in. MandoSquirrel wrote: I think the answer is yes! Probably more jazzy, I suppose. Still not used to plugging in. I know what you mean. I have pickups in all my guitars and rarely plug in. 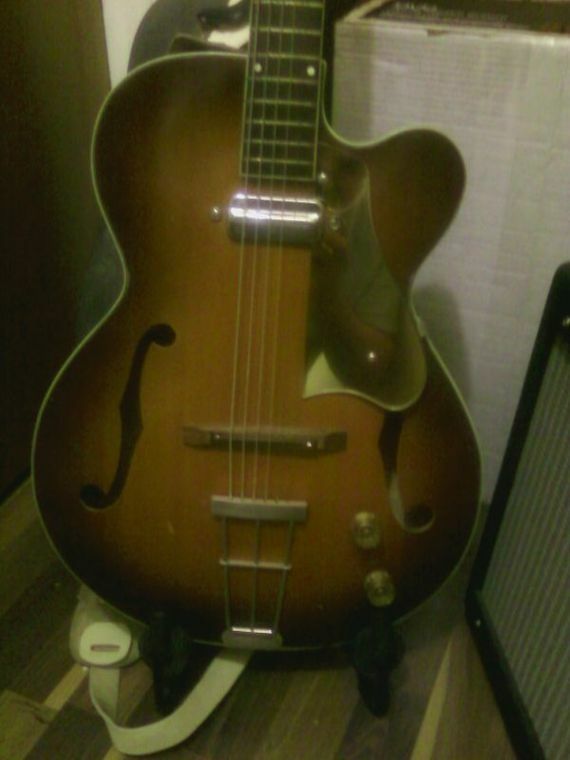 I do have an Epiphone dot that I run through a Line 6 pod, which generates some great sounds. The problem with the pod is that I usually run it through headphones! There's something wrong with that picture when you have to put on headphones so your electric guitar doesn't make too much noise!! And that's probaly why my hearing is so good; it's tp the point where i like to watch TV with the subtitles on. I have an excuse for subtitles; I watch a fair bit of BBC America! Mando goes electric! darn! Thats a pretty cool mic. The 51 came in 2 versions, 51 and 51S, the only difference being that the 51S had an on-off switch. Although it was advertised for music and public address applications, it found its main market in houses of worship. Like all Shure mics of the period, it had an Amphenol connector, so I hope yours comes with a cable. Note that the capsule was supported by foam blocks, which have generally turned to dust or rock by this time. The red screen you see is silk. It was red in the original 55 series, and changed to blue with 55S. Usually by this time, the silk has faded at the least, or even turned black from mildew, etc. This does affect the sound. The 51, called the Sonodyne, was an omnidirectional dynamic with low, middle, and high impedence settings. Here is the spec sheet for that mic. If you do flip that amp let me know. I may be interested. The mic came with a foldout, from Shure for the 51/51S. 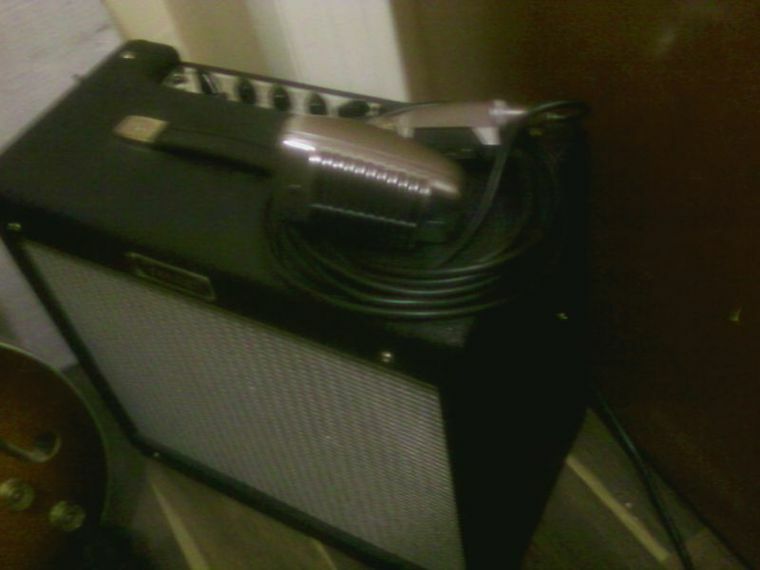 It came with a cable with 1/4 inch plug, and it sounds okay through the amp with a harmonica, though I didn't turn it up very high. I'm pleased with the mic. And yes, it has the on/off switch, and an indented switch for low, medium,or high impedance. The link came up not found. There's nothing wrong with the Blues Junior, I just think I may be happier with the 1965 Epiphone Galaxie EA33RVT I found, that's supposedly been refurbished. A similar one on ebay just sold for $399 plus $85 for shipping, after I paid $315, including shipping, for the one I'm awaiting. It's the same as the Gibson GA17 RVT SCout, made in USA. 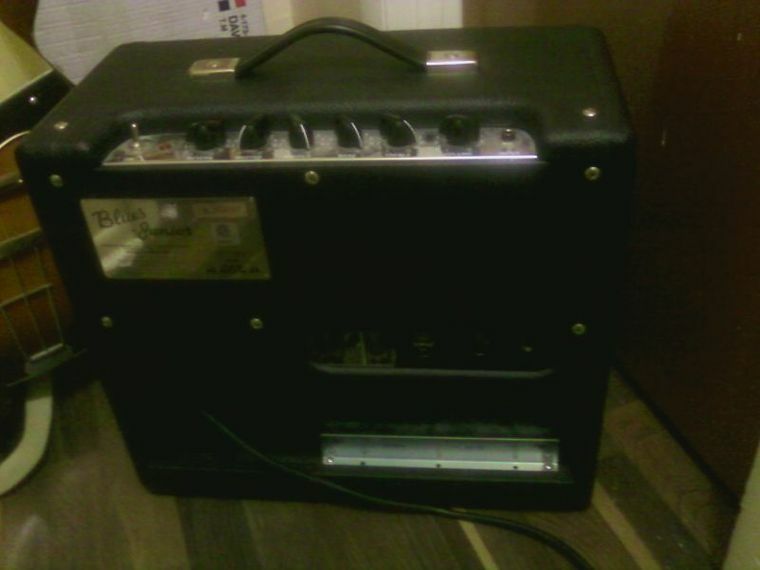 It has two inputs, where the Fender has one, and tremolo, which may not be necessary, but it's cool! Ten inch speaker instead of the twelve in the Fender, and much older; maybe I won't like it better, but I'm eager to find out. and installed a grounded 3 prong plug for safety! Congratulations! Now all you have to do is crank it up loud enough so we can hear you up hear in the Windy City.